Gordon Bennett is one of the most provocative and interesting contemporary artists to address issues of cultural identity, Aboriginality and social attitudes in Australia in recent times. His work has also frequently addressed the work of other artists who have referred to Aboriginality in their practice. Bennett's own cultural identity is fluid and he has identified as both Aboriginal and non-Aboriginal as a political point addressing his own positioning with the contemporary Australian art world. Within ‘Metaphysical landscape no 2' 1990 Bennett provides a view of a vessel approaching the shoreline, from a vantage point dominated by a Xanthorrhea shrub, a plant native to Australia and formally black boys or spear grass. Rendered in a field of white dots, contrasted with black shadow work, the image provides an interesting comment of the history of Australia that is particularly relevant to Sydney. The work reflects Bennett's transition from an expressive painterly style to one that incorporates visual references to Western Desert art. ‘Metaphysical landscape no 2' 1990 and Bennett’s work more generally, is located within the specific histories of Aboriginal and Eurocentric relations within Australia, questioning the prevailing wisdom of these histories. 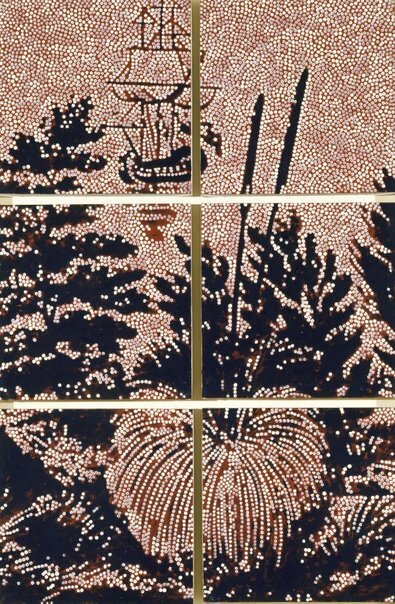 As Bennett states: "I draw on the iconographical paradigm of Australian - and by extension European - art in a way that constitutes a kind of ethnographic investigation of a Euro-Australian system of representation in general, but which has focused on the representation on Aboriginal people in particular." - 1993. Ace Bourke, Lines in the sand: Botany Bay stories from 1770 , 'Lines in the sand', pg. 23-29, Sydney, 2008, 25, 85 (colour illus.). Look , 'Yiribana: a facelift and a new show', pg. 28-31, Sydney, Jul 2005, 29 (colour illus. ).